Imprint Method: Embroidered - Plant your brand everywhere recipients go when you advertise on this Farmers Market Canvas Tote Bag! Made of a combination of 12 oz. cotton canvas and jute, it's available in three accent colors and measures 19" x 16" x 5 3/4". 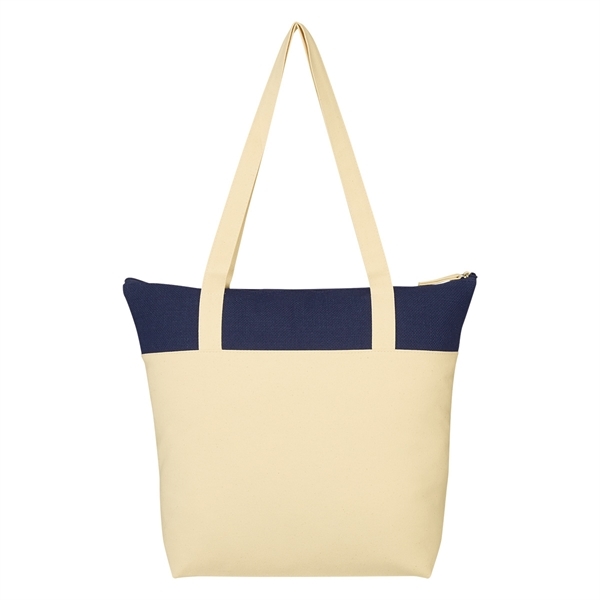 It features a top zippered closure to keep contents safe inside, a 5 3/4" bottom gusset and 30" carrying handles. Add your company's name and logo to create a marketing tool that will get maximum exposure for your brand. Recipients can spot clean and air dry to keep it looking great!